Image showing most of the windows that have been modified to use the Gauge Images. Anyone been around long enough to remember myUI? 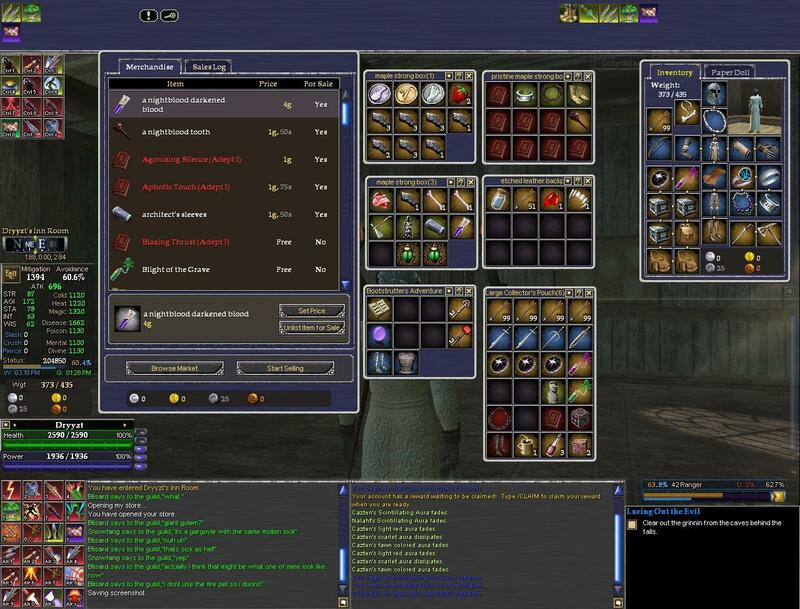 Well, I've started playing around in EQ2 again and have been working on updating myUI. It's going to be better than ever and hopefully I'll have a working version ready to go in a week or so. I've played a few other MMO's since leaving EQ2 and myUI has evolved quite a bit during that time as I applied the theme to other games. Now i'm back and using those same ideas now for EQ2. I'll be posting a screenshot or two really soon. for lack of a better name, this is myUI. Its not truely a complete UI skinning, but it's enough individual pieces that I wanted to upload the whole group. (slowly working on adding more pages and a more complete skinning). 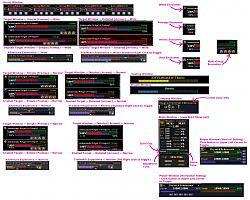 Anyone that played EQ1 and remembers the SARS interface... I started with one of his gauge images and modified it to suit my needs and work with the EQ2 standards.... there is a quest journal mod in there, and a hotkey mod, that I downloaded that I need to find again so I can give credit where it's due. Updated the following windows (mostly those with any sort of gauge). Casting, Experience, Target, Player, Group & Compass, and a reduced size Inventory window (got the idea from another mod, but wanted a different layout of the inventory slots). I also modified the chat window by moving the scroll bar to the right side instead of the left. Fixed the xml files that were modified in the recent patches (bags, mail windows, etc). Added new screenshots to show more accurately how the window pieces look today. Second screenshot shows the various gauge widths that can be chosen from (wide, normal, or narrow gauges for Experience, Target and Impliled Target). ** Added a couple new image changes for scroll bars and arrows. v1.0 fixed some problems with a few image files, fixed some target window problems and added the new con system functionality. improved a few image files and skinned a few more windows. v0.95 made a lot of adjustments to the various windows I orginally uploaded, as well as appying my skin/theme to much more of the overall UI. I hope you like it. as always, feedback is greatly appreciated. 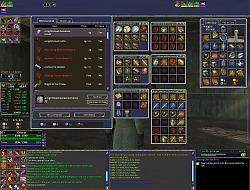 Updated several of the windows to provide additional information from the patch dated 1 FEB 05. I split the player stats info from the player and mana gauges. these two areas can now be positioned independantly from each other allowing a lot more freedom in placing the windows around the screen. I will be uploading a UI with the gauges in a vertical layout instead of the horizontal layout soon. (I want to finish updating the windows with all the information that's now available thru the client, such as vitality before uploading more than one version of the mods). I'm posting pieces that are my take on the SARS/myUI as individual pieces. Keep watching for my pieces as they come out. I really like this ui, I used it when I first started playing EQ2. The problem was there was not much support for it, and the skins didnt work after the patches and it didn't get updated. I'd go back to it if ya kept on top of it, it was a great skin! many many issues with this UI....its the best looking one on the site in my opinion but all the windows come up pitch black with nothing on them..can this be fixed perhaps? Can we get your player and group windows as seperate Interface pieces? is there going to be an update for this UI? Last edited by Frost : 08-17-2005 at 04:38 AM. Is there a way to get chat boxes black in background? Todays patch (06.08) really screwed up a lot of things. Working on fixing issues with the Guild Journal first. The fonts problem will take a while to work out. hopefully have an update soon. anyone else having troubles with this UI after the update? Sorry for the long delay in getting an update available. I just moved across the country and now i'm finally feeling like i'm settled in. I logged in over the weekend and immediately began working on bringing the UI up to date with the patches over the last few weeks. I have fixed the Journal window, the Market windows, and the coin issue from the Inventory. I will be working on a couple of other little fixes and then I plan to add in a couple of the requested features. I hope to have an update to upload either tonight or tomorrow. Thanks for all the feedback and support. any chance for a possible update with the new ui mods? Love the UI but I do have one problem. For some reason I can't see any items that are in my inventory slots when I open my market board. So in turn, I can't use the market board that is in my room to sell items. The coin indicator at he bottom is reading "99p,99g,999s999c sold in this session" and it also reads that I have this same amount in my possesion, which of course I don't. I can access my house vault but without the market board active I can't move any items from my inventory to sell. It also means that I can't reset prices for any of those items in my vault. If you would like a screen shot of what it looks like, I can send one! Last edited by boonn : 04-15-2005 at 08:33 PM.